Interrogative: What should professional fitness trainers teach their trainees about performing the curl? Instruction 1 indicates that the hand should be supinated and the fingers and thumb are wrapped around the bar. Instruction 2, as written, allows an open grip with the thumb not wrapped around the bar. Instructions 3 through 6 describe where the grip on the weight is relative to the shoulder. All instructions consider the arm as a straight line such that the shoulder, elbow, and hand can be oriented in a line perpendicular to the floor – shoulder over elbow over hand gripping weight. This ignores carry angle, the anatomical observation that the forearm deviates laterally from a perpendicular upper arm. If the upper arm is directly under the shoulder with a fully supinated hand position, the hand cannot be. Interestingly, instruction 7 directs the trainee to retract the scapula which will narrow the width of the shoulder posture and further exacerbate grip width issues. As such instructions 3 through 7 are contradictory. If the upper arm is directly under the shoulder with a fully supinated hand position, the hand cannot be. Instructions 8 through 10 indicate that a complete extension of the elbow at the beginning of each repetition is correct, however book pictorial and website video depictions demonstrate incomplete extensions to as much as 20 degrees short of complete extension of the elbow. Instruction 11 suggest that the correct posture would be in normal vertebral extension, however instruction 12 indicates the proper position is with a “flat” back. Does this imply that the trainee should be coached to actively flatten the normal lordotic and kyphotic arches of the back? Instruction 13 uses a jargon term, “core”, without definition. Without defining what musculature is involved, the instruction cannot be executed properly. Instructions 14, 15, and 16 all indicate that the only movement in the curl is elbow flexion. However the end point of movement varies by source. Instruction 14 provides nothing more than “upward” as guidance with no discernible end point, allowing for incomplete or complete range of motion movements to be considered correct. Instruction 15 says near the anterior deltoid, thus specifically indicating that incomplete range of motion movement is acceptable. Instruction 16 provides the most robust instruction of the three as it indicates a desired full range of elbow motion. However, pictorial and video illustrations accompanying these instructions deviate from the written word with the weights ending point at about 6” away from deltoid in one example, another shows the end ranges of motion being complete elbow extension and elbow flexion with approximately 30o of range of motion remaining, another shows end ranges of motion being complete elbow extension at the start and elbow flexion with approximately 45o of range of motion remaining. In all descriptions the fact that the biceps brachii muscle crosses both the elbow and shoulder is ignored. Full range of motion exercise for the biceps requires elbow flexion and shoulder extension. The final conflicting issue is nomenclature, combined these sources use the name “bicep curl” interchangeably to describe barbell and dumbbell curls. The self-proclaimed world authoritative materials promulgated by the NSCA are inconsistent in recommendation, incomplete in scientific support, lacking definition, inadequate in anatomical description, and impractical in application. A clear and uniform description is not discernable. The said publications and recommendations create an environment where education of professionals on performing and teaching the curl is inconsistent and poorly described. Further, the name of the exercise is not consistent between publications thus increasing the amount of confusion. 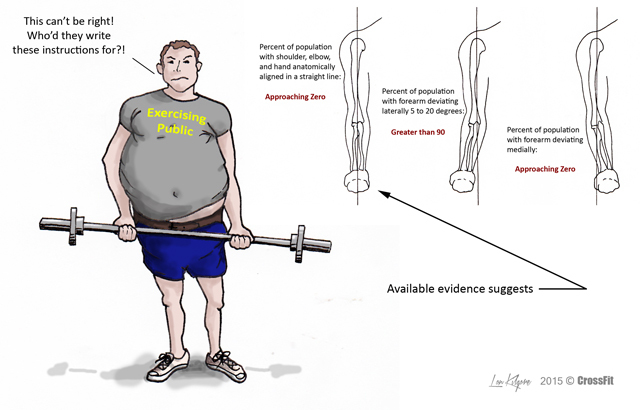 The authorship, editorial, or graphical issues present may ultimately have negative effects on individual fitness results and the safety of the public, as correct technique cannot be reliably determined from the published statements, texts, and videos. Guys…it’s a curl. Come on. These articles have started to drift away from “defending the brand” into the realm of fitness McCarthyism. I was right there with you on power cleans, squats, and deadlifts. You had valid points. But curls? What’s next? Calf raises? Shall we perhaps critique the NSCA for the font they use in their textbooks? I agree with your implication that Dr. Lon Kilgore is putting the NSCA’s movement instruction through an exceptionally detailed, point-by-point and joint-by-joint critique. What you miss, however, is that the NSCA has brought this level of scrutiny upon itself. The NSCA and its partners are lobbying the government to require all trainers to attend their certifications or face a “misdemeanor of a high and aggravated nature,” punishable by up to a year in jail. If the NSCA believes that it deserves government-granted authority, then it must be held to a very high standard. On the other hand, if the NSCA cannot intelligibly instruct a movement as simple as the bicep curl, then how could it possibly be qualified to regulate CrossFit or the rest of the fitness industry? Of course, and I agree that if government regulation is the way forward, whoever is granted that authority should be held to the highest standard. I did not attempt to put CrossFit “on a pedestal as the golden child.” Nor has CrossFit ever tried to lobby for government-granted control over the rest of the fitness industry. Yes but do you think CrossFit as a company is in a position to critique power clean technique (or curls, for that matter), for example, when the video I just posted was itself posted on CrossFit’s OFFICIAL YouTube channel? I certainly think that our guest author, Dr. Lon Kilgore, who has published a half dozen or so books on the subject of exercise, including co-authoring one of best-selling books on lifting weights ever, is “in position to critique power clean technique” instruction. Furthermore, we acknowledge that under load and/or fatigue, athletes’ technique may deviate. This is a distinct matter, however, from NSCA technical instruction deviating from what’s humanly possible. Right, and I understand that Kilgore can be considered a subject matter expert on the topic. You’re not answering my question though. You’ve taken the position over the past several months through the “YOU Be The Judge” articles that the NSCA’s teachings on form/technique are poor and/or inconsistent. I don’t disagree with you. I suppose what I’m after here is the following: is CrossFit (via Kilgore) in a position to critique a movement (we’ll say power cleans for the sake of continuity) when it’s own official YouTube page posts videos endorsing what can only be described as a “heaving power clean”? Please refer to my distinction earlier between instructional material media documenting athletes performing a workout. The former is prescriptive, the latter descriptive. Lon’s series is a critique of the NSCA’s instructional material, not their published workout media. Your critique would relate were you to examine the CrossFit L1 seminar’s movement instruction, for example. Right now you’re just criticizing a workout video, however, not published instruction. Again, just a few examples. But are you willing to put forth the notion that CrossFit is completely free and clear of contradictory technique/coaching advice and that the NSCA is the only one at fault? No, and I did not even attempt to make that claim. Why are you rebutting a claim I did not make? I did not say that CrossFit is perfect. It’s not. Nor did I claim that all CrossFit instruction everywhere is consistent. “The NSCA and its partners are lobbying the government to require all trainers to attend their certifications or face a ‘misdemeanor of a high and aggravated nature,’ punishable by up to a year in jail. You agree that the NSCA’s instruction is contradictory and that an organization aiming for government-granted authority should be held up to scrutiny. That’s the extent of my point. That you find CrossFit’s instructional material contradictory disproves not my point. Nor is it even relevant. I’m not disagreeing with your’s, Kilgore’s, or CrossFit’s claims that the NSCA posts inconsistent coaching points. I’m instead asking if it’s FAIR for you guys to post multiple articles on the NSCA’s inconsistencies when CrossFit is equally at fault. Seriously…you guys have almost as many “NSCA is wrong” articles as there are Land Before Time movies. So you agree that BOTH CrossFit AND the NSCA are inconsistent. It seems somewhat naïve to cry foul at the NSCA when you yourself just stated that CrossFit instruction isn’t consistent either. I think it would help to provide a correct instruction when creating these critiques. Pointing out that different texts have minor differences in placement of hands for example, or that “jargon” words are used such as core and flat back, is a distraction. I think we could all agree that proper movement slightly varies from person to person, for example foot position may have toes slightly out or forward depending on the individual. Lon’s point is not criticizing the curl for being an isolation movement, but criticizing the NSCA’s instruction of the curl. You miss the mark. And to more specifically address your final point regarding government regulation. Yeah, maybe the NSCA isn’t the best horse to put our money on when it comes to government authority. But would you contend that CrossFit is? I know you’ve said in the past that no, CrossFit is not claiming that it should be the authority. So would you then have the fitness industry be unregulated? I understand that you guys are on the defensive, and rightly so, because government regulation would negatively effect CrossFit’s current certification structure. Would you contend that churning out hundreds of “trainers” each weekend is a better alternative to limited the quantity in favor of quality (through government regulation in general, not necessarily NSCA-backed regulation)? I am also glad you realize CrossFit’s not aiming for a government-granted monopoly, either. 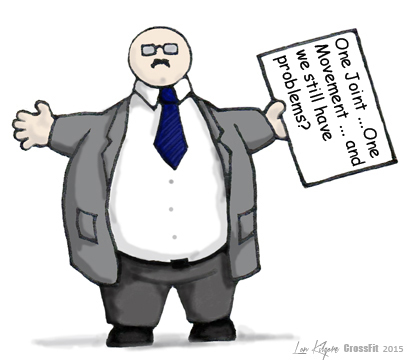 You propose that we should limit the overall quantity of fitness trainers in America. Yours is an unreasonable, even unethical goal. With hundreds of thousands of Americans dying yearly from lifestyle related diseases, this country needs more fitness and fitness trainers, not fewer. CrossFit’s courses deliver the L1 as an entry level certificate course that enables a trainer to start gaining experience training clients in functional movements. To be certified as a CrossFit trainer, however, requires additional coursework, further hands-on instruction, at least 750 hours of experience, and passing additional testing. Right. I get that. But I don’t want to have an argument on the merits of CrossFit’s L1 certification. We’ve seen that a million times and it’s a rabbit hole with you guys. My question, which you circumnavigated, is whether it’s better to have more “adequate” trainers or fewer “better” ones. I think you’ll agree that a regulated industry is better than an unregulated one (fitness or otherwise). Your point “hundreds of thousands of Americans dying yearly from lifestyle related diseases” is hard to disagree with, however, your solution “this country needs more fitness and fitness trainers, not fewer” escapes my question again. Let’s come at it from another frame of mind: to address a poor economy, is it better to print more money or is it better to impose regulations? In wars past, is it a better solution to throw hundreds of moderately trained soldiers at the enemy or is it better to use fewer, highly skilled soldiers to win the fight? I could come up with hundreds of anecdotes, but the point is the same. So, again, should the fitness industry (and, in effect, people’s health) be unregulated simply so that more trainers can be produced at a higher frequency, as you seem to claim? I do not agree that a highly regulated fitness industry would be better than an unregulated one. You agree that the NSCA is not qualified to regulate the industry. But what you miss is that no organization is willing and capable of effectively regulating fitness. Not NSCA. Not ACSM. Not USREPS. Not the government. If you would like to argue that regulation should increase, who would you like to put in charge of that regulation, and on what basis? Well that’s where I would put it on CrossFit, the NSCA, ACSM, whoever, to work together for the common good of “the American people”. Publishing trite articles slamming an organization for something as dismissible as a bicep curl is hardly moving anyone in a positive direction. Is a fractured fitness industry composed of combating schools of thought a better way forward than a synergized community that acknowledges respective weaknesses while celebrating strengths? Let’s hypothesize. I contend that the NSCA’s greatest strength is the depth and breadth of it’s scientific research (the Ohio State study aside…let’s please not start that debate again). I contend that CrossFit’s greatest strength is it’s approachability and appreciation of community. Everyone will agree that CrossFit has done amazing things for the fitness industry. SO, all that being said, would you agree that perhaps working WITH the NSCA (and similar organizations) as opposed to AGAINST them will do more to advance the common goal of fitness (and by extension, the “healthiness” of the public)? The research capabilities and scientific access that the NSCA brings to the table would do wonderful things for CrossFit, and CrossFit’s new take on fitness would do wonderful things for the NSCA (which we can both agree is, at times, out of date). If you disagree and instead think that it should be an “every organization for itself” model, I’d be interested to hear why you take that side. You are suggesting that CrossFit Inc. cooperate with the organizations that knowingly spread baseless and fabricated claims about CrossFit? You are suggesting that CrossFit Inc. cooperate with Coca-Cola and Pepsico’s sponsored exercise bodies? You are suggesting that CrossFit Inc. cooperate with the organizations that are trying to turn our affiliate owners and trainers into criminals? Really? This is your suggestion? Given the NSCA and ACSM’s history of false statements about CrossFit and efforts to criminalize our affiliates, on what basis would CrossFit trust the NSCA or ACSM enough to act jointly? I’d love to hear your thoughts. No, Russ. Calm down. I’m not suggesting you become besties with Coke and Pepsi. In this situation, no one is free and clear of blame (CrossFit included). It seems as though we are at a point now where all the fitness industry’s biggest players (namely, CrossFit and the NSCA) spend more time pointing fingers and expending energy outwardly than looking inwardly to address weaknesses and advance the common goal of health and wellness. The basis upon which this blog is built…supporting a fitness brand…is an admirable one. However, 15 of the 15 articles on your front page aren’t supporting CrossFit so much as they are blasting everyone else. You completely missed my point. CrossFit is not going to partner with organizations that are trying to make its affiliates criminals. CrossFit is not going to partner with organizations that knowingly spread baseless aspersions regarding our training methods. Lastly, I’m not blaming ACSM or NSCA for taking sponsorship money. I’m blaming them for taking Gatorade sponsorship money and then promulgating hydration advice that recommends drinking as much as tolerable. This advice is still cited in 2015. There is no basis of trust, or common interest, to motivate a partnership between CrossFit and ACSM/NSCA. I have been critical of the NSCA for well over a decade, almost two. They quite specifically state that they are the “world authority” on strength and conditioning. As such their instructions and publications should be generally beyond reproach and easy challenge. As this series demonstrates, this is not the case with the NSCA and its publications. It was these inadequacies of the NSCA and higher education instruction in weight training that led to the first editions of Starting Strength and Practical Programming. I have been very lucky in that the CFJ and now the Russells Blog have given me a medium with which to express concern, stimulate discussion, and hopefully create movement towards a fix of the NSCA, if it indeed it can remain as a viable professional organization representing the needs and good of the commercial fitness industry and the apparently healthy gym going population. It is my hope that people don’t just cry foul but rather focus their attention on correcting the problems within the NSCA and our industry. Its not about who has fewer or more problems, its about fixing them. And we can’t fix them unless they are identified and there is a plan to move forward. I don’t see a plan, or even recognition of the problem by the NSCA. I’m hoping that NSCA aligned folks don’t just yell at me or claim persecution, rather that they take the knowledge of these demonstrable weaknesses and work towards making their organization better at what they propose it should do and be. And by the way, the curl, I didn’t originally plan to treat it in the series (I envisioned a series limited to at most 20 parts about “functional” exercises). But since the curl is a stalwart inclusion of virtually every pop fitness workout in magazines and books, it needed discussion. I also try not to be biased, everything I write has application not just within the CrossFit community but to the broader personal training and fitness industry.